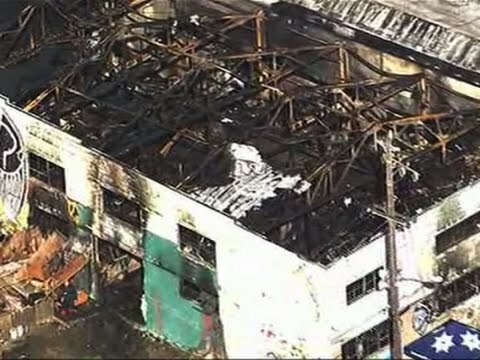 OAKLAND, Calif. — The death toll from a fire that tore through a warehouse hosting a late-night dance party climbed to 33 on Sunday as firefighters painstakingly combed through rubble for others believed to still be missing. Less than half of the charred remains of the partly collapsed structure had been searched, and crews clearing debris were expected to find more bodies as they advanced, Alameda County Sheriff's Sgt. Ray Kelly said. Officials said they have identified seven people who were killed. Among them is Donna Kellogg, according to her father, Keith Slocum. He declined additional comment. Kelly said those killed range in age from teenagers to 30-plus years old. Anxious family members who feared the worst gathered at the sheriff's office to await word on their loved ones. They were told they may have to provide DNA samples to help identify remains. The building known as the "Ghost Ship" had been carved into artist studios and was an illegal home for a rotating cast of a dozen or more people, according to former denizens who said it was a cluttered death trap with few exits, piles of wood and a mess of snaking electric cords. "If you were going there for a party, you wouldn't be aware of the maze that you have to go through to get out," said Danielle Boudreaux, a former friend of the couple who ran the warehouse. As many as 100 people were there for a party Friday night when the fire broke out just before midnight. Fire officials were still investigating the cause of the blaze, but they said clutter fueled the flames, there were no sprinklers inside and few exits to escape. Boudreaux identified the operators of the Satya Yuga collective as Derick Ion Almena and Micah Allison. She had a falling out with Almena when she convinced Allison's parents and sister about a year ago that the warehouse was a dangerous place for the couple's three children to live. The couple rented out five recreational vehicles and other nooks on the ground floor as living spaces. A rickety makeshift staircase led to a second floor where concerts were held. Former residents said there frequently was no electricity or running water. Oakland planning officials opened an investigation last month after repeated complaints from neighbors who said trash was piling up and people were illegally living in the building zoned as a warehouse. An inspector who went to the premises couldn't get inside, said Darin Ranelletti, of the Oakland Planning Department. The city had not confirmed people lived there, but a former resident said she had been lured in part by reasonable rents in a region beset with a housing shortage and exorbitant leases driven by the tech boom. Shelley Mack said she wasn't told the residence was illegal until after she moved in a couple years ago and stayed for four to five months, paying about $700 a month. She said she was instructed to tell visitors it was a 24-hour workspace for artists and when outsiders or inspectors planned to visit, residents would scurry to hide clothes and bedding. "It's like a horror house. Just horrors in there," she said. To a first-time visitor, though, the labyrinth of uniquely designed spaces was "stunning," said Alastair Boone, a University of California, Berkeley student who arrived at the party with five friends around 11 p.m.
Photographs from before the fire showed that the Bohemian community of musicians, painters, woodworkers, dancers and other artists had decorated the scene with Tibetan prayer flags, Christmas lights and scores of wooden statues of Buddha, the virgin Mary, Jesus Christ, elephants and dragons that sat atop pianos and turntables. Tapestries hung from the walls, mannequin legs and arms stuck out from the ceiling and a small wooden spot of floor was used for art performances. "It was obvious to me everyone who lives there cared about each other and were invested in a space they made a home," Boone said. Almena did not immediately respond to emails or phone numbers associated with him. Authorities declined to talk about the manager, saying they were focused on recovering the bodies and consoling families. A man identified as Derick Ion posted a Facebook message early Saturday, saying, "Everything I worked so hard for is gone. Blessed that my children and Micah were at a hotel safe and sound." He drew rebukes online from others who said he was warned the building was unsafe. Almena, 46, has lived in California since at least 1990, mostly in Los Angeles, where public records show he was evicted from a North Hollywood apartment in Los Angeles in 1993. Allison, 40, spent much of her life residing in Northern California, although she had also lived in Southern California, where she filed for a fictitious business name, Sacred Image, at a Los Angeles address. Online records listed the building's owner as Nar Siu Chor. The Associated Press could not locate a telephone number for her Saturday. Efforts to reach her at other Oakland addresses associated with her were not successful. Boone said she had just received a tour of the property and stepped outside when someone yelled, "Fire!" "In a couple of minutes there were flames coming out of the windows and black smoke was just billowing out of the house," she said. Some of the people who got out were crying and others stood silently in shock as firefighters arrived to put the flames out. "The people who lived there were clustered together, and they were just so sad," Boone said. "They were losing their loved ones, and there was nothing they could do." Monica Kat was outside the warehouse Saturday and said she feared four of her friends are dead. "They're still not accounted for, and I can only think the worst at this point," she said. Melley reported from San Francisco. Associated Press writers Olga Rodriguez, Tim Reiterman and Sudhin Thanawala in San Francisco, and Jonathan J. Cooper, Terry Chea and Janie Har in Oakland contributed to this report.